PixelJunk has been a busy topic lately, what with the announcement of PixelJunk Shooter for the Playstation Network, and now the PixelJunk Monsters Deluxe game will be coming to the PSP while sporting useful online co-op. Not quite a port, but not quite an original title, PixelJunk Monsters Deluxe on the PSP will give players 4 player online co-op through a lobby system new to the PSP. Many may remember how the original only had local co-op, so this is already a nice change. The developers made sure to point out that this is not a direct port by any means, but rather the same game with additional content and features unique to the PSP. First, how does the online work? The PSP will connect through wi-fi to a series of "lobby" rooms, and you can monitor what other players are doing in their game with play-by-play text to join their game without being lost, or create your own lobby just for friends. It's unsure if there will be an actual chat feature in these rooms, but that seems to be the direction they're headed to make the online experience work best. In these lobby rooms, you can set bookmarks should you come across players you meld particularly well with, making new friends is what community is all about after all. 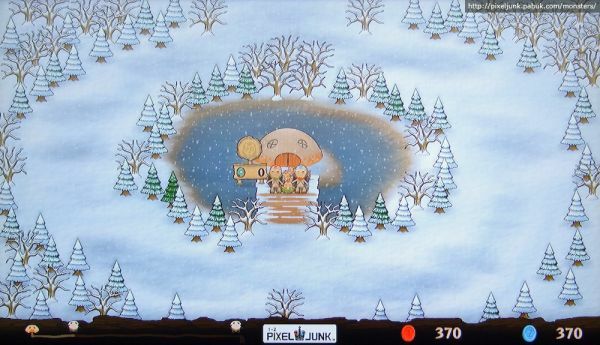 You may be wondering how PSP utilizes communication with online gameplay in PixelJunk Monsters Deluxe, and here's how it works according to Playstation Blog. "Within the game itself, you can talk to your partner-in-crime by using a new ring menu that gives you a set of simple icons you can string together that are surprisingly effective at conveying what you want your friend to do. It’s a lot of fun running around and directing the other player while you dance on towers." We look forward to seeing how all of the features on the PSPGo go work with these new online games, and Pixel Junk is a pretty safe bet as a testing platform. Page created in 0.5517 seconds.